This Ordinance set out the terms on which the transportation of convicts to Western Australia would operate. Twenty years after the Colony was founded, transportation had been authorised by the British Government. Western Australia, along with South Australia, had been unique among the Australian colonies in that it was founded as a private settlement. 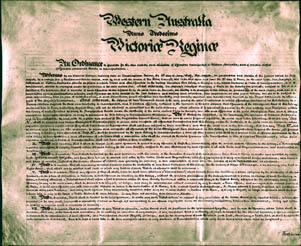 However, in May 1849, after a complex series of manoeuvres between, on the one hand the Legislative Council and various Governors in the Colony and, on the other hand, the British authorities, the latter decided to act (to a large extent, ahead of colonial opinion), by issuing an Order-in-Council declaring Western Australia as a Colony to which convicts could be sent. This Order was published in the Colony in November 1849 and in the following months the Legislative Council agreed to this Ordinance setting out the terms under which the convict system would operate. The first boatload of convicts arrived on the Scindian at the beginning of June 1850 just prior to the passage of the Australian Constitutions Act 1850, the Imperial Act setting out the terms and conditions under which the various Australian colonies could make constitutions. Because of the decision to take convicts, Western Australia found itself subject to special procedures during its subsequent delayed transition to self-government. Black, D, The House on the Hill: A History of the Parliament of Western Australia 1832–1990, Parliament of Western Australia, Perth 1991. Battye, JS, Western Australia: A History from its Discovery to the Inauguration of the Commonwealth, Oxford, Clarendon Press, Perth, 1924. Stannage, CT, A New History of Western Australia, University of Western Australia Press, Perth, 1981.